Who was most energized by Sunday’s historic vote in the House of Representatives to approve health care reform? Republicans hope that angry conservatives will be mobilized by the new law to show up at the polls in large numbers in November’s midterm elections. But if television viewing data are any indication, those most engaged by the bill’s passage may actually be its supporters. 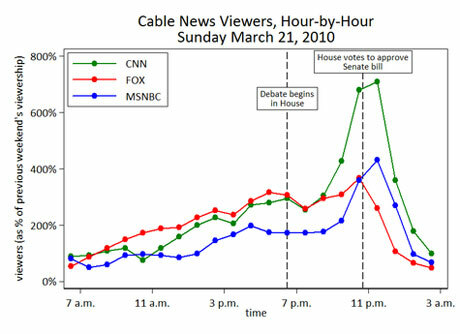 As shown in the figure, viewership climbed throughout the momentous day across the board: all three networks drew more viewers than usual. But as the House moved toward its vote to approve the Senate’s heath care bill, viewership on CNN and MSNBC skyrocketed while Fox News remained relatively flat. After the vote passed, ratings at the more liberal-skewing nets continued to rise, with CNN registering a whopping 700 percent increase in viewers over the previous weekend and MSNBC 400 percent. Meanwhile, disheartened (or, at least, uninterested) Fox viewers tuned out: in absolute numbers, more people watched Rep. Bart Stupak’s riveting pro-life defense of the bill on CNN than on Fox News. Of course, we can’t say for sure what (if anything) this means for November. But these data indicate that in the short term, the health care reform bill may be more of a rallying cry for liberals than a call to arms for conservatives. Patrick Egan is an Assistant Professor of Politics and Public Policy at New York University. He blogs at The Monkey Cage, where this post was originally published.